Where have all the aprons gone? 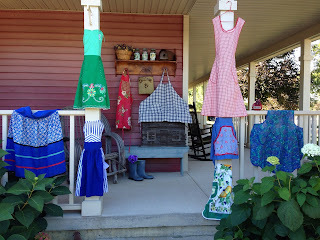 My interest was piqued when looking for dresses, hats, purses and aprons for my garden ladies. They are hard to find. Explored the flea markets and antique shops, found a few I liked. My collection is growing and I wanted to share them with you. They are so fun to look at and try on. My mom and grandmother wore aprons all the time. When they went to the kitchen that was the first thing that was put on. They were a practical necessity. They covered up the dress underneath to protect it from soiling. Plus aprons were used for everyday tasks. Perfect for carrying eggs from the hen house, vegetables from the garden, perhaps a receipe. Mom used to wipe the hands and the dirty face of my little sister. That apron had a pocket to which collected glasses, bobby pins, had a tissue, just about anything that seemed important at the moment. I wear my aprons every so often, mostly around holiday time. It feels good, a sense of home, a memory. I remember you Mom!